Announced earlier in the year as the replacement to the entry-level 18-Mpix EOS 650D (known as the Rebel T5i in the US), the EOS 750D (Rebel T6i) shares many of the same features and body as the similar-looking EOS 760D (Rebel T6s) launched at the same time. The similarities don’t end there. Both models use a 24.2-Mpix APS-C size CMOS sensor with a higher pixel count than their predecessors and other current models in the range. By contrast, both the EOS 70D and high-end EOS 7D Mk II feature 20.2 Mpix sensors. One other advancement over those two models is the new DIGIC 6 processor with an ISO range of 100-12,800 (with expansion to 25,600). The EOS 750D includes an updated Hybrid CMOS AF III system with a separate 19-point phase-detection sensor located in the mirror-box for viewfinder operation, and image sensor-based phase detection pixels to aid AF performance in Live View that Canon claims is close in performance to the dual-pixel AF of the 70D and 7D Mk II. Add an improved 7560-pixel color-sensitive sensor for more accurate metering and WiFi with NFC, all while sharing the 3-inch fully-articulated LCD touchscreen, 5fps continuous shooting and full HD/30/25p video of its predecessor, it’s quite clearly one of the more significant upgrades in recent times. Finally, the new camera measures 5.2 x 4.0 x 3.1″ / 13.2 x 10.1 x 7.8 cm and weighs 19.58 oz / 555 g, body only. 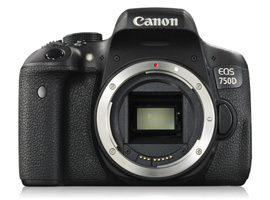 It’s available now at a body-only price of $749 (USD), around $100 less than the EOS 760D (T6s). 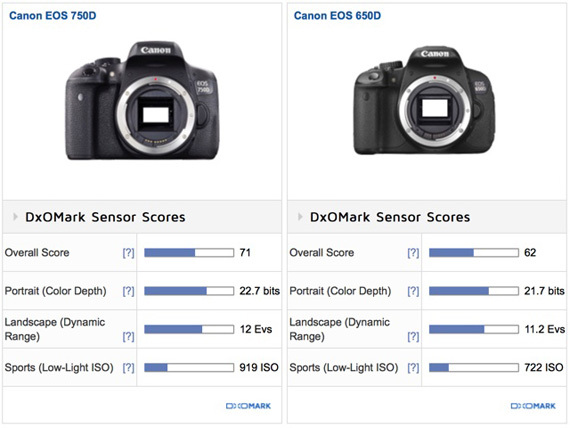 Achieving an overall DxOMark score of 71 points, the EOS 750D ranks alongside other recently-released APS-C crop cameras from Canon, including the high-end EOS 7D Mk II (at 70 points) and the mid-range EOS 70D at 68 points. The EOS 750D also ranks alongside such cameras as the PowerShot G7X (71 points) and the Olympus PEN E-PL7 (72 points), though those models use smaller sensors. However, while the EOS 750D is somewhat behind the best of the current models using APS-C sensors (such as the Sony A5100 at 80 points and the A6000 at 82), the new sensor shows significant improvement over its predecessor in the EOS 650D (T5i), which we’ll compare next. Compared to its predecessor, the new model shows improvement in each of the metrics, and significant improvement at that. The sensor in the EOS 750D is the first of Canon’s APS-C format models to achieve a 12-stop dynamic range at base (up from the 11.2 stops of the EOS 650D), and the wider DR is not just limited to low ISOs but is present at high ISOs as well. Not only is there a dramatic improvement in DR, but also there’s an extra 1 bit of color depth at 22.7 bits and a slight improvement in low-light capabilities of around 0.25 Ev (1/4 stop). Dynamic range is wider not only at base ISO but throughout the sensitivity range. Against the EOS 70D and the maker’s flagship APS-C model, the EOS 7D Mk II, the new camera’s sensor performs admirably. In fact, in our lab tests it performs marginally better than the EOS 70D overall and is sufficiently close to the EOS 7D Mark II to call it a draw. In real-world use it would be difficult to tell the three apart, although the sensor in the EOS 70D, with its dual pixel AF technology, is slightly behind the other two in DR at low ISOs. Dynamic range is wider at base compared to the EOS 7D Mk II, but that difference diminishes from ISO 200 upwards. However, the EOS 70D can’t quite match the other two until at least ISO 1600. 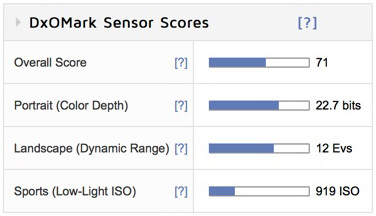 While Canon has made some gains in low ISO performance, the sensor in the EOS 750D is still lagging behind the best of the current APS-C sensors, ostensibly those found in the Nikon D5500 and Sony A6000. Both rivals have a clear advantage in noise levels at low ISOs that accounts for the high color depth, wider dynamic range — 14 stops at base for the Nikon D5500 — and higher low-light ISO scores, and yet they still manage to match or slightly improve on high ISO performance as well. Dynamic range is still well behind the best APS-C size sensors at low ISOs, although the EOS 750D can match them from ISO 1600 onwards. As an entry-level model the Canon EOS 750D (T6i) makes some compromises in layout and controls — for example, there’s no top plate LCD as found on the EOS 760D (T6s), but sensor performance is on par with the camera maker’s mid- and high-end models, the EOS 70D and the recently-introduced EOS 7D Mk II. While it’s true that the Canon sensors are behind the very best APS-C models in terms of low ISO performance (particularly noticeable when comparing dynamic range), the company is making some noteworthy advances.